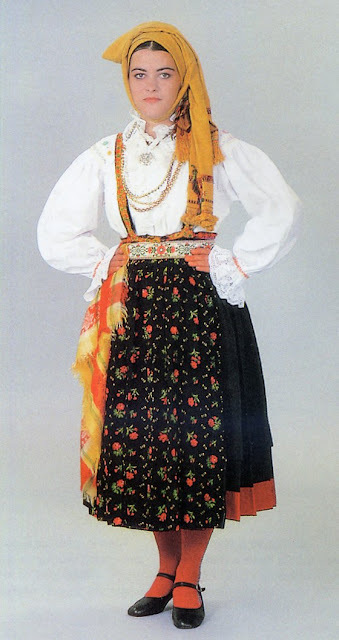 Today i will talk about one example from the third major costume region of Croatia. This is the Adriatic or Littoral region, This region covers the entire Adriatic coast between the Italian and Albanian borders, the vast majority of which is in Croatia, along with the small coastal regions of Slovenia and Montenegro. Here is a general map of the Croatian part of this region. 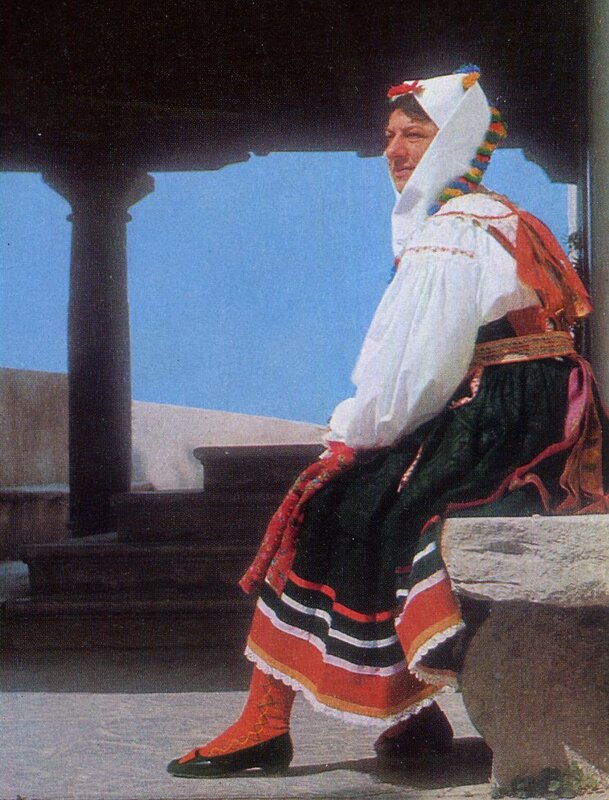 I will be talking specifically about the costume of Otok Krk, the island of Krk. [This is not an abbreviation, this is the complete word]. 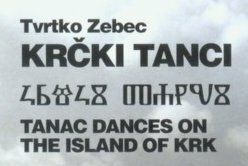 I know that sometimes Anglos complain that slavic languages don't have enough vowels; i guess that this would be a good example. You can see Krk located on the map above, it is the northernmost, and generally considered to be the largest of the Adriatic Islands of Croatia. Here is a closeup map of the Island. 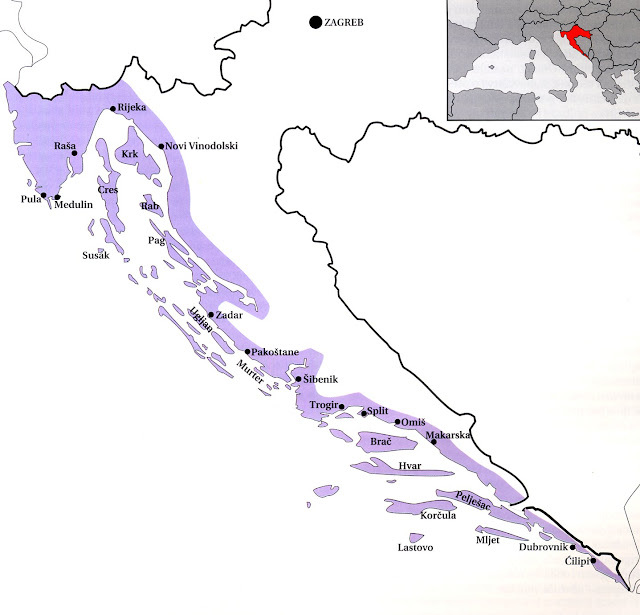 The city of Krk was a bastion of the Vegliot dialect of the Dalmatian Language, but the rest of the island was inhabited by speakers of the Cha dialect of Croatian. For further information, you can read this article. The island is traditionally considered to have 7 citadels, each dedicated to one of the 7 deadly sins. One unique distinction of the island is that this is one of the few places to retain the original slavic alphabet, the Glagolithic, which was developed by St. Cyril. Because the shapes of the letters are rather complicated, it was superceded in most places by the Cyrillic alphabet, which is based on the Greek, and to some extent, the Hebrew Alphabets, and was most likely introduced by one of Cyril's students. Here is more information on the Glagolithic. On Krk, the Glagolithic was used to write the Roman Mass and other Church books in the Old Slavonic Language. Here is one example from a recent book cover from Krk. At the top is the author's name, followed by the title of the book in the Latin Croatian alphabet, followed by the same title in Glagolithic, and on the bottom an expanded translation in English. There is a one to one correspondence between the Glagolithic and Croatian letters. This is also evidence of the close connection that the people of the island feel with this alphabet. There is basically one costume on the island, which has minor local variations. The skirt is shorter than in most of the Adriatic region, but shows many of the typically Mediterranean features characteristic of the region. Here are a few images of the costume from different sources. 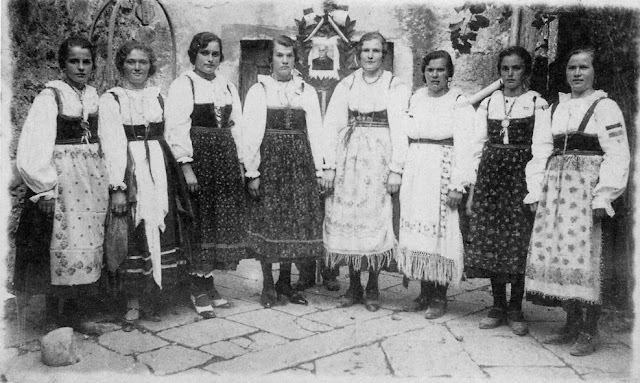 This first is a photo taken in the market place in 1936 of people from Kornić. Two different groups perfoming the local traditional dance, Tanac. The dress costume from the town of Baška. Vladimir Kirin's rendering of the costume of Omišalj. 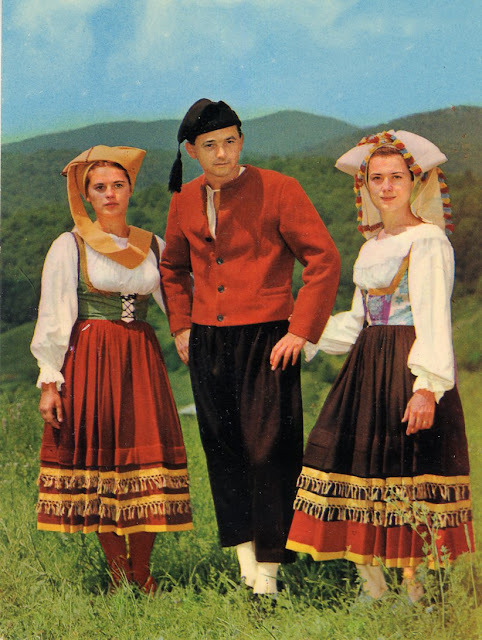 Costume from the town of Vrh. 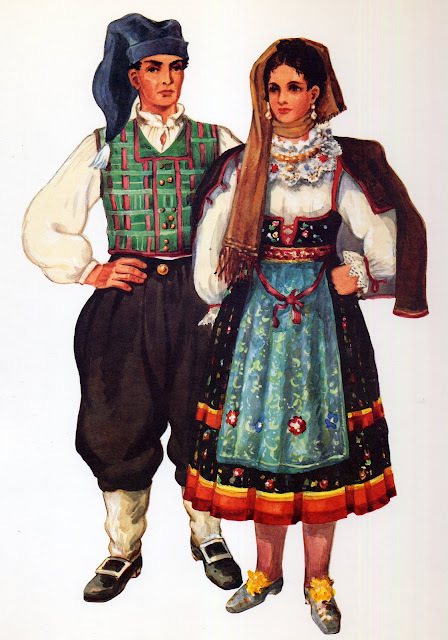 I have specific information on the costume of Kornić, so the specific examples i will show will be from there, but as you can see, they will serve as good examples for the entire island. As usual, the basic costume piece for women is the chemise. This was tradionally made in one piece, as in the rest of Europe, but by the late 1800's, had been seperated into two garments, the 'blouse', Košulja, and the first, or narrow underskirt. This development is known from many places. 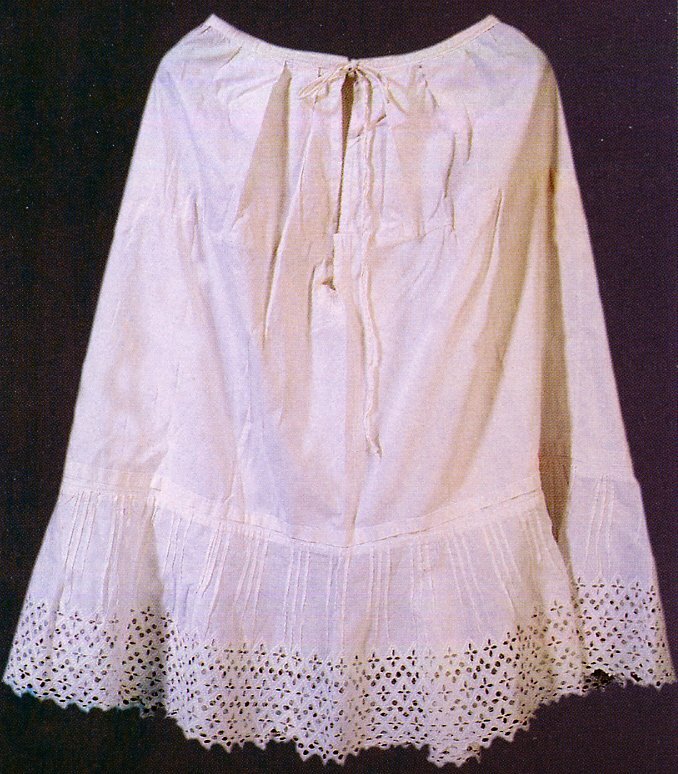 The chemise is made with the shoulder inserts, unlike those in the Dalmatian mountains. This has simple embroidery, and there is usually some red close to the outer edge of the lace. 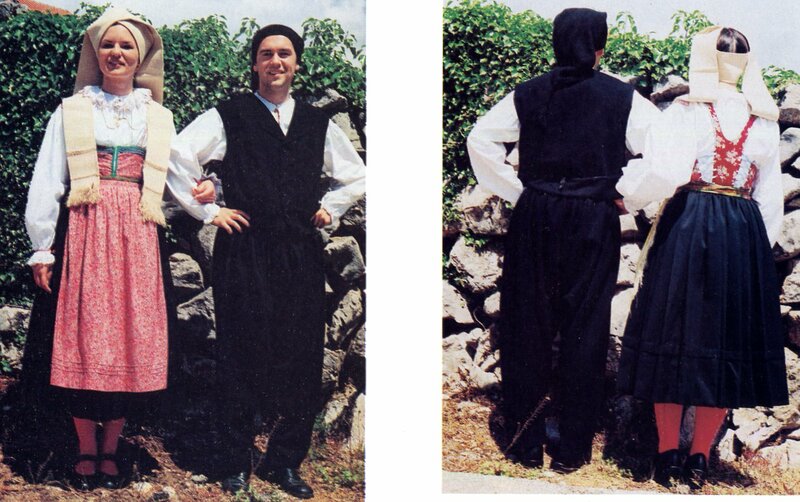 Here is an image and the cut of the Košulja. There is lace attached around the cuff and neck openings. The linen is gathered in a sort of 'smocking' which shows designs upon close examination. The first, or narrow underskit was originally just the lower part of the chemise. It may have been seperated when there was a desire to make the 'blouse' part fuller. It is not possible to widen the lower part, because it provides necessary modesty when dancing. The first underskirt is closed on a waistband with a hook, but may also have shoulder straps. Here you can see what i mean. 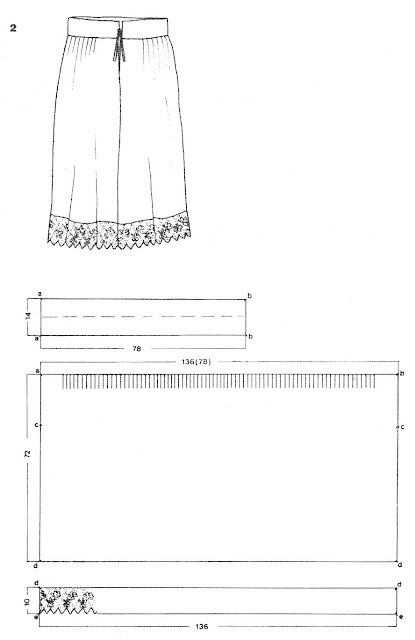 The hem is finished with lace or eyelet. Over this is worn a second, fuller underskirt, and sometimes a third, each one fuller than the one underneath, but still less full than the top skirt, so that a tiered effect is made when spinning. 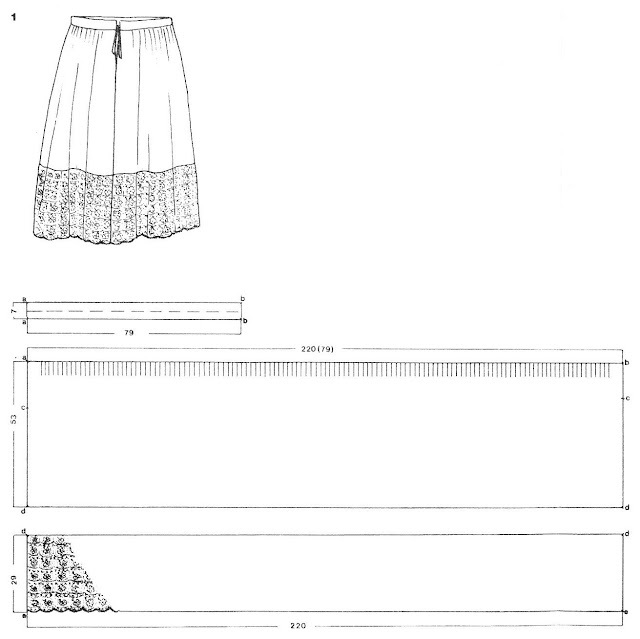 Each successive petticoat has a wider band of commercial eyelet on the hem. 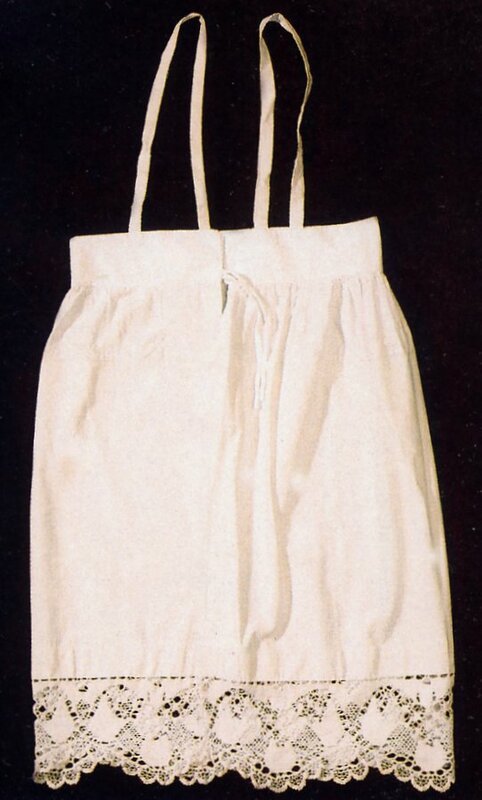 There is a skirt with an attached bodice, which closes on hooks in front, and is laced with ribbon in back. The bodice varies in height, as you can see from the images. 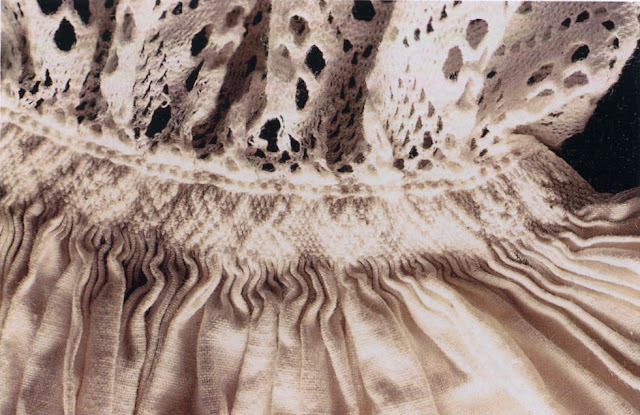 The edges of the bodice next to the lacing and hooks is sometimes boned. The straps and the edges of the bodice are edged with seam binding. 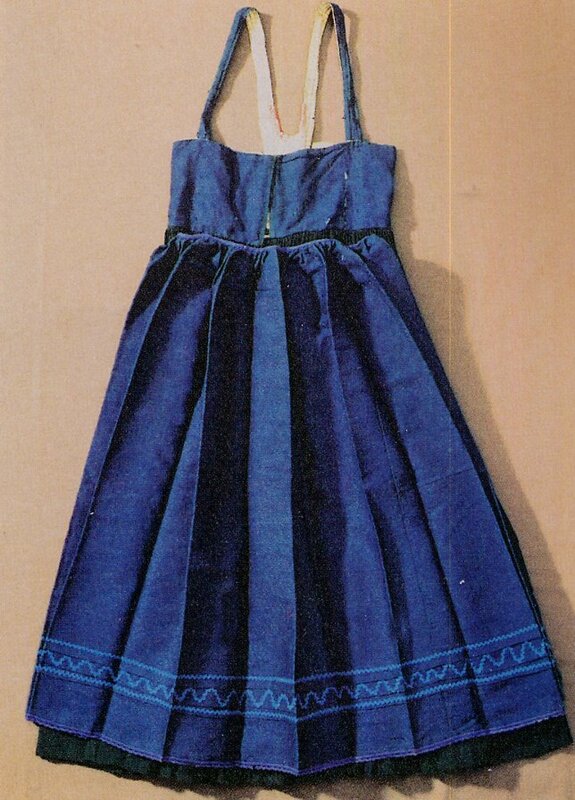 There are shoulder straps attached to the upper edge of the bodice. 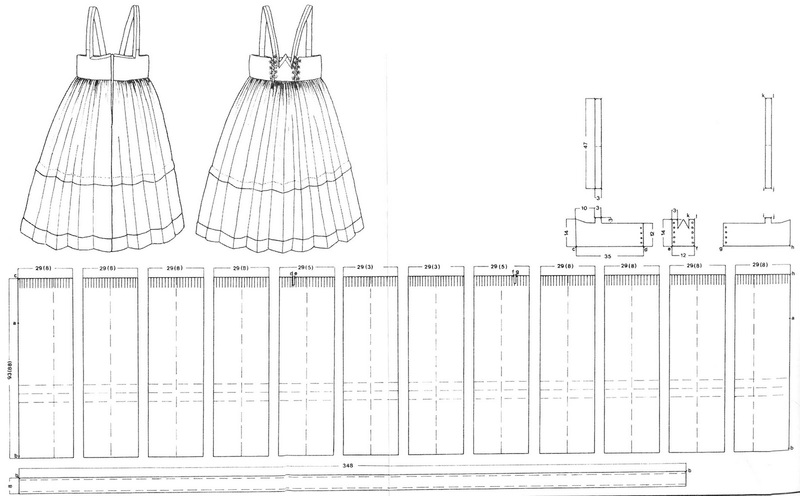 The skirt is gathered into the bodice, and large pleats are made in the body of the skirt. 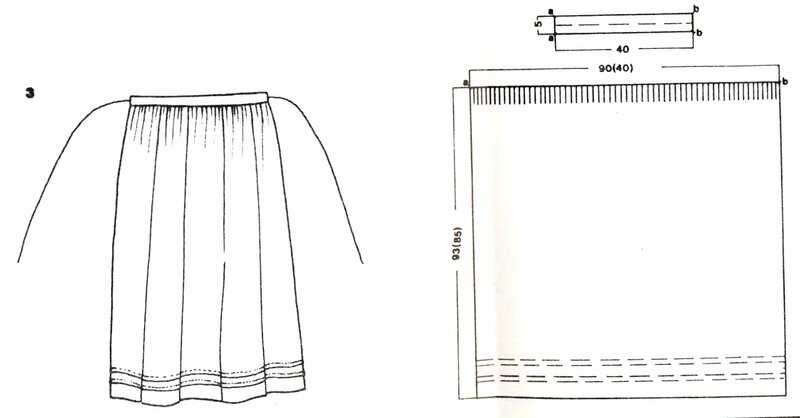 Generally one or more horizontal pleats are made towards the bottom edge, to help the skirt maintain a bell shape when spinning. 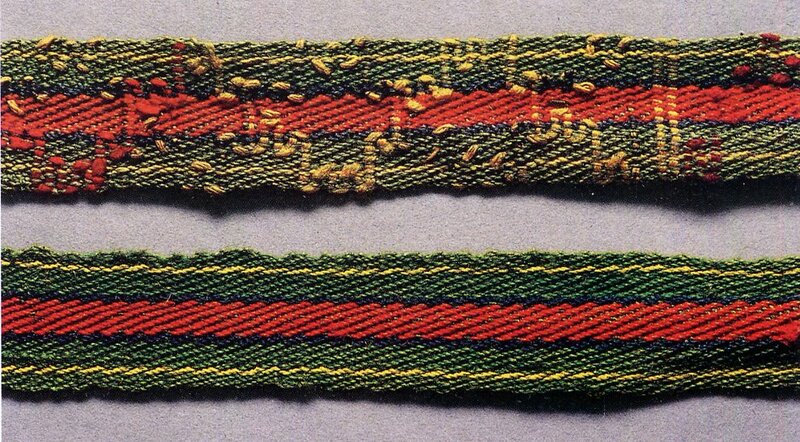 In some towns, a girl who is engaged will sew on a ribbon close to the hem after each time the Banns are read in Church. the skirt and bodice are often of two different colors, and the skirt is sometimes 2-toned. Here is a sketch of the back of the bodice. Here are some examples of the skirt and bodice. 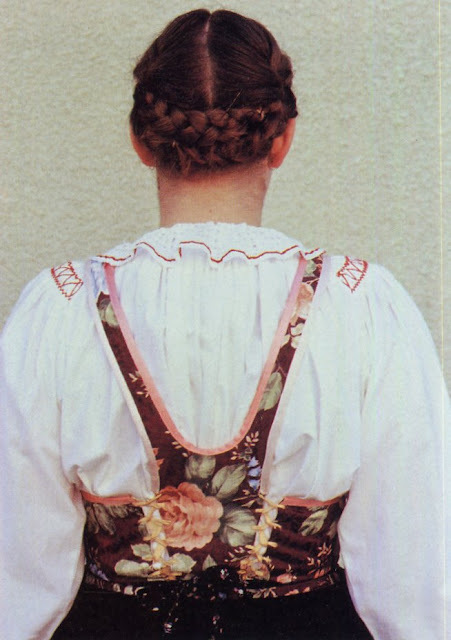 The bodice is often of a different color. 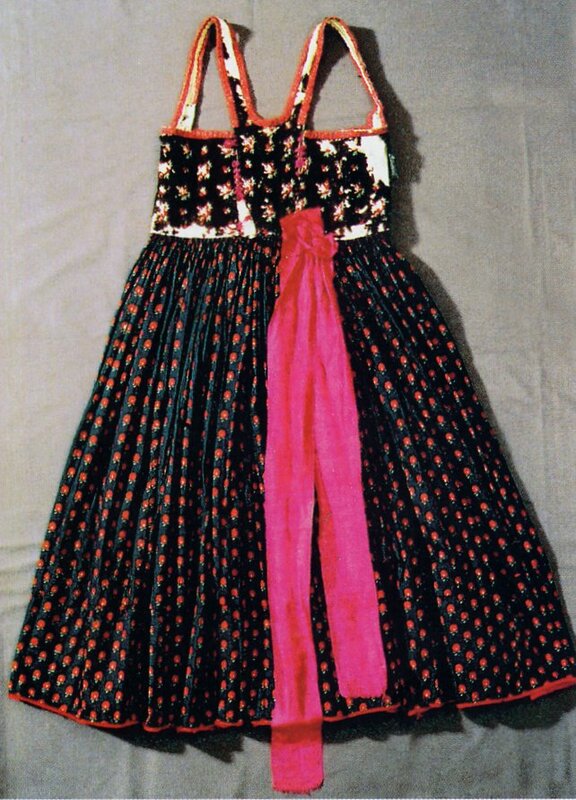 The ribbon seen here is a traditional part of the wedding costume. There is a simple apron, gathered into a waistband, which is often made of flowered cloth that matches the bodice In place of an apron, a shawl is sometimes worn, as seen in the old photograph at the top of the posting. Very occasionally, three shawls are tucked into the waistband by one corner in place of an apron. A narrow woven sash, the kanica, is tied around the waist. 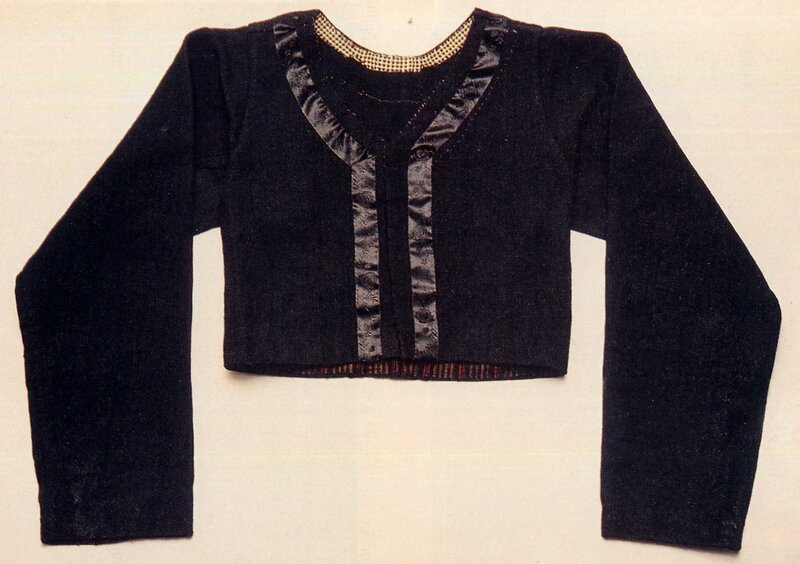 A jacket, called haljica, may be worn with the costume. The hair is dressed in braids which are wrapped around the head. 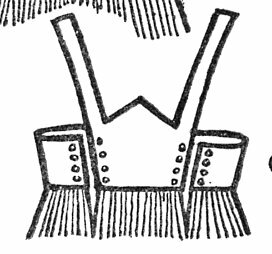 The married woman's headpiece consists of a cloth, called Rub, which is about 2.5 m long and 42 cm or so wide, folded in four lengthwise, and wrapped around the head, the two most common ways of wrapping are called 'two horns' or 'winejug'. You can see examples of each in the images above. There used to be more, indicating a woman's place of origin and status of life, but most of the others have been forgotten. 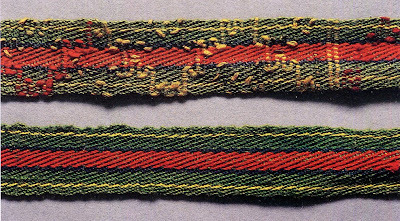 There are often decorative weavings or embroidery or trim placed crosswise close to the ends, or trim with pompoms placed along one edge, depending on the town. Jewelry consists of hoop earrings with pendants, crosses and religious pendants and medallions. Elaborate jewelry is a hallmark of this region, but not much is known from this particular island. Of course, this depends on the economic status of the particular woman. I will continue with the description of the men's costume in the next posting. I will close with one more image of this costume. 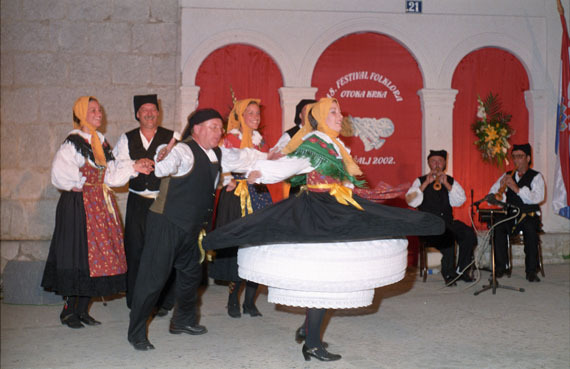 Here is a link to the Croatian National Ensemble doing the Tanac folk dance of this island. Unfortunately this is a 'professional' video. 'Professional' videos feel that they have to have at least 6 camera angles, change shots every 3 seconds or so, include useless views like that from the back of the hall and closeups of the musicians and the dancer's faces, and in general hide more of the dance than they show. 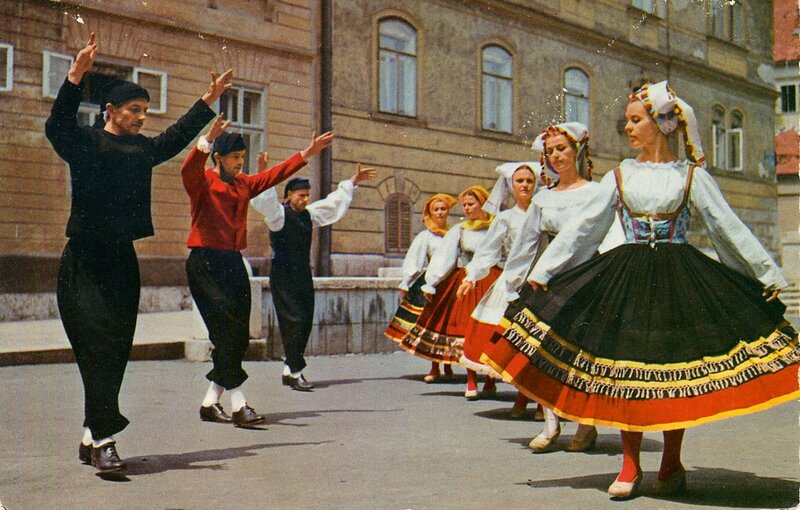 Speaking for all who are interested in Folk Dance: Put ONE camera where it can view the dancers from head to foot, and where they fill the view and LEAVE IT THERE. When we watch a video of a dance performance, we want to SEE THE DANCE, not the audience, and not fancy camera work. Oh well. In any case, this is a wonderful performance, even if the editor denies us the opportunity to see much of it. You get a good view of the costumes as well. Here is a video made by a local group from this island performing at the International Folk Festival in Zagreb, which takes place once every 4 years. I need to figure out how to get back there, I attended once in the 1980's, and enjoyed it immensely. 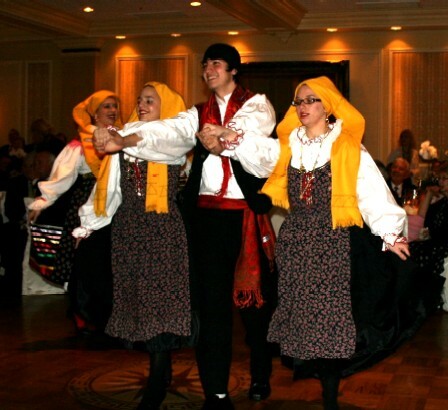 I have recently returned from Kansas City where i taught a Greek Folk Dance workshop, which went quite well. I thank Betsy and Chris for the opportunity.